Online educational guides, iBooks, and EPUBs that teach pharmacy law to students and professionals. "Too bad that Allstate has trademarked the “you’re in good hands” slogan, because that is the best way to summarize my view of Creative Approaches — you’re in good hands with Creative Approaches." CDs The original CD-ROM product. 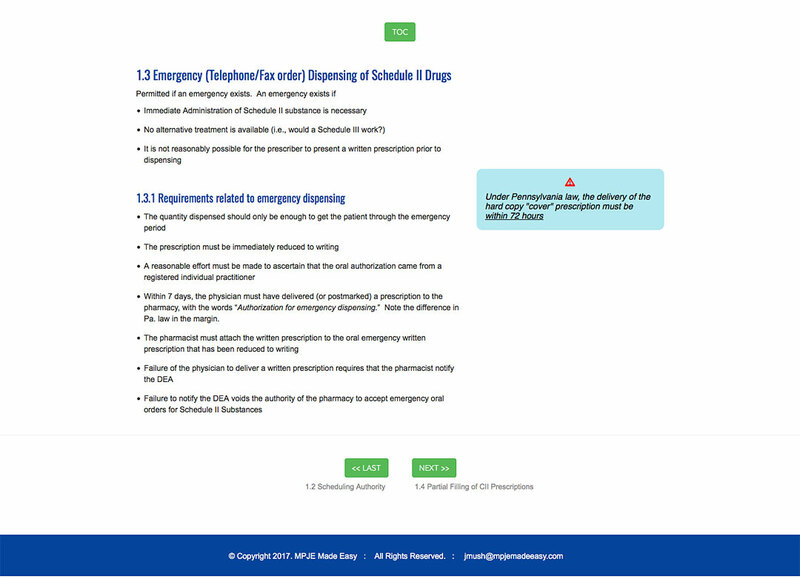 I have been involved in pharmacy law education for quite a few years, and most of my original teaching had been limited to doing stand-up presentations and distributing printed materials. At some point I realized that I was missing out on an opportunity to market some of my material. 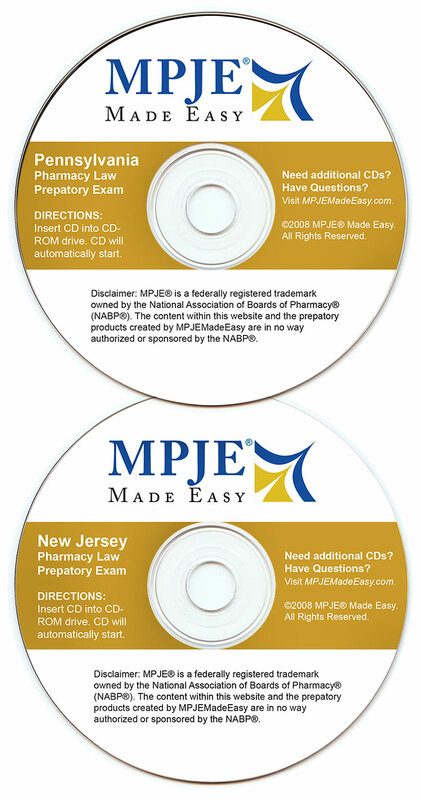 More specifically, I noticed that there were several companies that were marketing pharmacy law exams on CD’s. 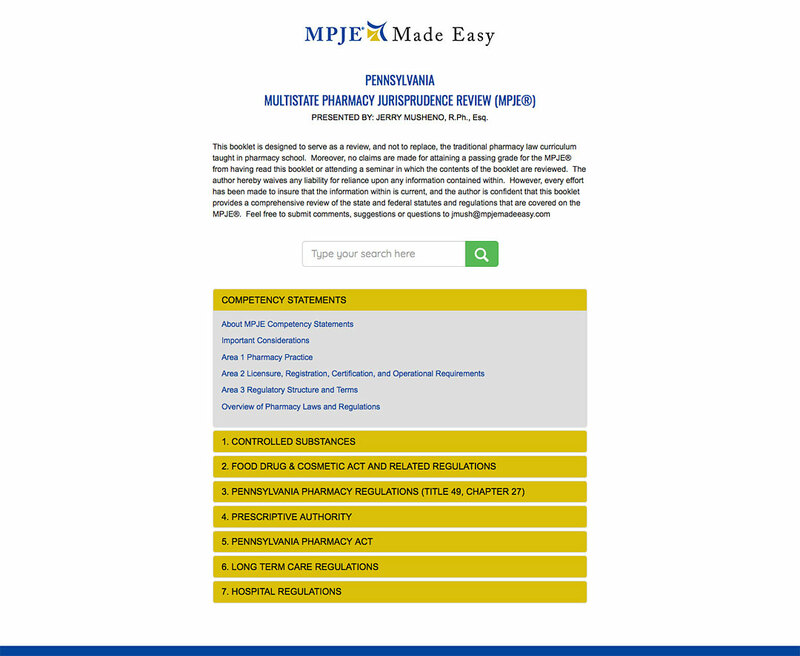 There is a pharmacy law exam, called the MPJE®, that is required for pharmacy licensure. I knew that I had the ability to compete with these companies, and that I could develop questions, but I didn’t know the first thing about this type of technology. That’s where Creative Approaches stepped in. 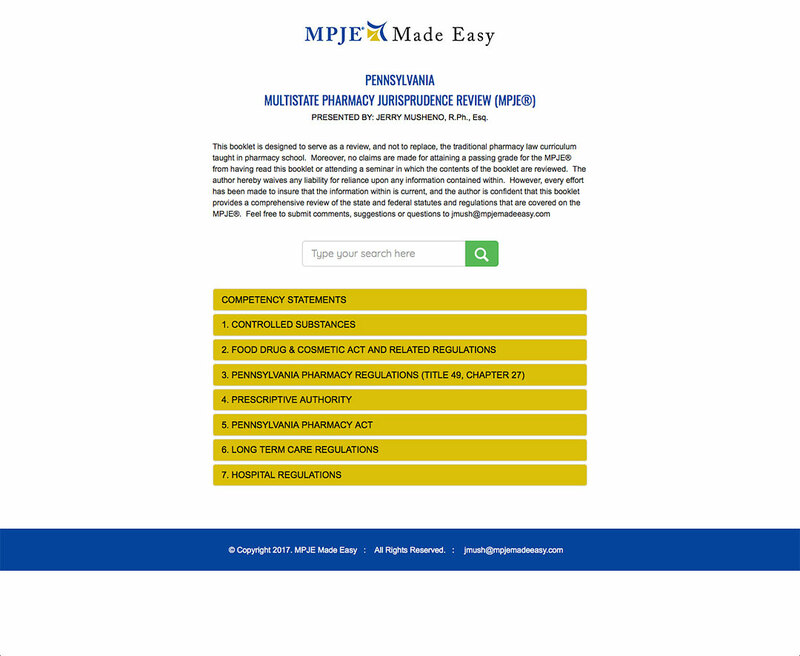 Not only did they develop a very professional looking cd, but they also came up with a very attractive logo and even helped name my new company - MPJE Made Easy. The CD product took off even better than I expected. It didn’t take me long to figure out that there must be a better way than going to the post office every time I made a sale. Not only that, but there was the logistical problem of not being able to do immediate updates, and having to pack written addendums with the cd in the event that any of the content changed before a new batch of CD’s was produced. Again, it was Creative Approaches to the rescue. Not only did they seamlessly transport the cd to an online presence, but did it in such a way that I did not have to worry about piracy concerns. Upon purchase, individuals would be given an access code and were limited to a single attempt at the exam. Moreover, the online exam could not be printed or downloaded. However, the technology does allow me to grant additional access upon request. Most importantly, though, users of the product have routinely complimented me not only on the content, but the ease of use of the product. Online Deploying the quiz questions online. "Working with Creative Approaches has allowed me to stretch beyond my comfort level. For several years, I had been producing extensive paper manuals on my own that contained federal and state pharmacy laws and regulations. Although I had done fairly well with the product sales, I was always aware that piracy was an issue. After discussions with Creative Approaches, they were able to convert my manuals to a secure online presence that is very pleasing aesthetically, but even more importantly, Creative Approaches patiently provided me the training and reassurance that I needed, so that I am now able to edit the manuals effortlessly on my own." Along with my mock pharmacy exams, I had also developed over the years a very comprehensive manual for several states (well over 100 pages each) that covered both federal and state law. I would routinely print the manual out for various stand-up presentations that I typically presented in May, just before students would be taking their actual MPJE exam. Although the lectures were very well received, again I had the issue of piracy, as some students would inevitably share the manuals with their colleagues. I never thought that the manual could be converted to an online version because I had so many macros built in to the manual, as well as an elaborate outline numbering system, in addition to call out text boxes on every page. Creative Approaches assured me that they could convert my manual to an online product that would look every bit as attractive as the paper version. I was always convinced that the layout of my manual is what separated it from the other products that were available, and I was hoping that Creative Approaches could come close to duplicating my existing layout. True to their word, Creative Approaches provided a template that very closely resembled my hard copy manual. In addition, they incorporated the extensive original text into the online version of the manuals. Up until this point, I had relied on Creative Approaches for everything, and my only job was to supply the material and they took it from there. However, for the online manual, it was clear that it was going to be impossible for Creative Approaches to take ownership of the product, if for no other reason than the sheer volume of material, and the inevitable continual changes that would have to be made to the manual to keep it current. I also forgot to mention that I am terrified of this type of technology, and that I was afraid that I was going to mess something up that couldn’t be repaired. I am happy to say that Creative Approaches was very patient with me and meticulously explained how updates to the manual needed to be made. This included technology that I had never used before; assigning navigation, adding hyperlinks, changing styles, and providing links to a treasure trove of documents that are invaluable to the students, and which placed my product head and shoulders above the competitors. In addition, Creative Approaches provided all of the instructions that I needed in writing as well. However, like any project, there were also some unanticipated situations that came up that Creative Approaches was extremely responsive for in helping me to resolve. In response to my piracy concerns, Creative Approaches developed a unique access whereby users are granted an initial access code and a secondary code upon each subsequent access that only goes to the respective e-mail of the purchaser. Users need to enter 2 codes every time they access the manual. Again, problem solved by Creative Approaches. Finally, I almost forgot to mention that Creative Approaches also set up a payment system for me on PayPal, where my only involvement is to open up e-mails that tell me every time someone has made a purchase. 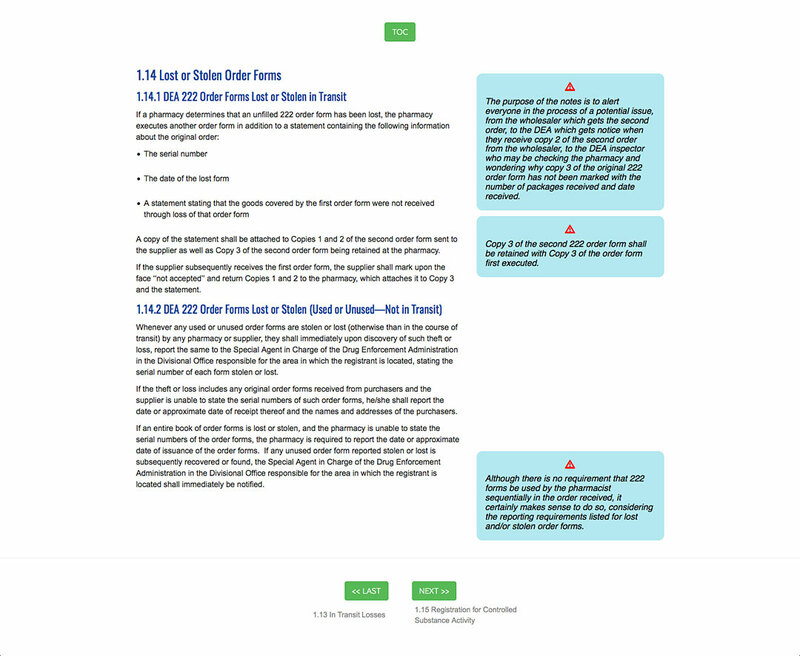 Visuals of one of the online guides. Mobile TOC with open topic. "Most recently, I have been asked to develop a manual that students can access online but that also provides students the ability to download it to their personal devices and make notes on the material. Needless to say, Creative Approaches has a solution and is developing iBook versions of the manuals to do just that. ...you’re in good hands with Creative Approaches." Carrier Corporation & Topaz Publications, Inc.
We always go the distance... and then some.